The literal meaning of "Nongin", the state bird of Manipur (Syrmaticus humiae) is one who follows the track, train and movement of rain and cloud. In the legendary hill folk-tale, it is believed that the souls of two newly married young couple who deeply loved each other converted into "Nongin" after their death due to poor economic condition and prolonged starvation. Another saying is that local hunters killed the two couple by mistake and their souls converted into "Nongin". After that the myth and belief in the mind of the common people is that those who killed "Nongin" will get the sin and wrath of killing the couple. It may be an olden conservationist positive thought to protect and conserve this precious and seriously endangered bird of the state. It was also the royal bird of the ancient Meetei Kingdom of Manipur. The King of Manipur used to present the feathers of this beautiful bird to the brave hunters and soldiers in recognition of their bravery and contribution to the land and kingdom. This is a resident bird of the Eastern Himalayan region and belongs to the order of Galliformes and family of Phasinadie. Its habitat ranges from grassland of deforested areas to steep rocky slopes with forest and scrubs. Male has chestnut and blue-black color with white banding along scapulars and across wings, and has strongly barred tail. The female has narrow whitish wing bars, and white tips to tail feathers. Both the sexes have long graduated tail and red facial skin. A. O. Hume, a British civil officer identified this bird scientifically during his stay in Manipur in 1883 and named the bird after the name of his wife. 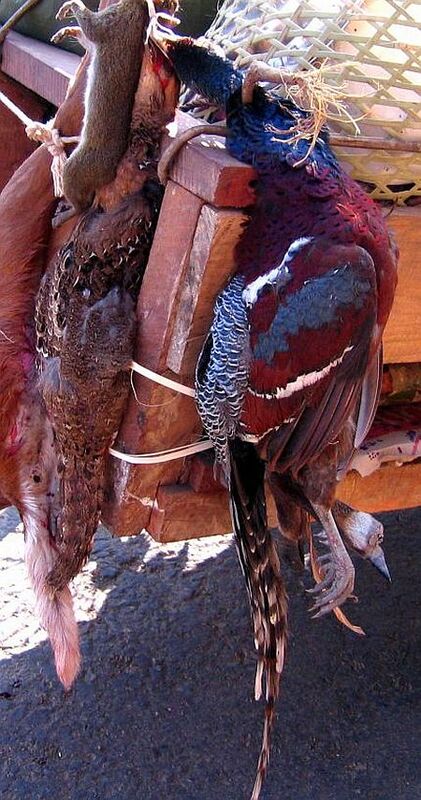 Thereafter, the bird is known as Mrs. Hume's Bar Pheasant. 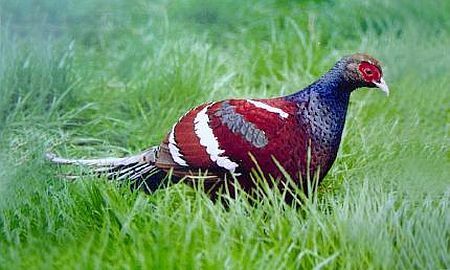 Mrs. Hume's Bar Pheasant is one of the seriously endangered bird species protected under the schedule I of the Wild Life Protection (Act), 1972. Even though this beautiful and highly endangered state bird of Manipur is protected under this act, no one could not trace the habitat of the bird for the last two decades in Manipur. At the same time, no one is serious to find the habitat and to protect it. Sometimes and in many occasions Dr. R.K. Ranjan Singh, Director, Academic Staff College, Manipur University and Dr. Kh. Shamungou Singh, Retd. Reader, Deptt. Of Zoology, D.M. College of Science used to chat with me of the status and where about of the last habitat of this precious bird in Manipur. While tracking for this bird I was landed in a workshop and come to know that "Nongin" is also the state bird of Mizoram. It was so strange and wonderful moment for me because; I did not have any idea about this before and not ready to accept it very easily. It so all happened when I was invited with Dr. R.K. Ranjan Singh to join a regional workshop at the North Eastern Hill University (NEHU), Shillong which was held on 15th to 17th December, 2007 to strengthen the Indian Bird Conservation Network (IBCN) under the aegis of the Bombay Natural History Society (BNHS), Bird Life International in association with the Royal Society for Protection of Birds (RSPB) and Darwin Initiative for Survival of Species, United Kingdom. Kailam Wild Life Sanctuary Churachandpur District. * R.K. Birjit Singh contributes to e-pao.net regularly . The author is a regular contributor to the reputed science journals, "The Resonance", Science Reporter, "Hornbill, Birdlife", published respectively by Indian Academy of Science, Council of Scientific and Industrial Research(CSIR), Bombay Natural History Society(BNHS) and Co-organizer of Science Meet, Coordinator of "Year of Scientific Awareness"(YSA), Understanding Planet Earth(UPE) under NCSTC, DST, Govt. of India. In addition, the author is the census coordinator of "Waterfowl Census programme at Loktak wetland" and providing data's to the Asian Waterfowl count of the Wetland International, South East Asia with Dr. R.K. Ranjan Singh. This article was webcasted at e-pao.net on 24th August 2009.